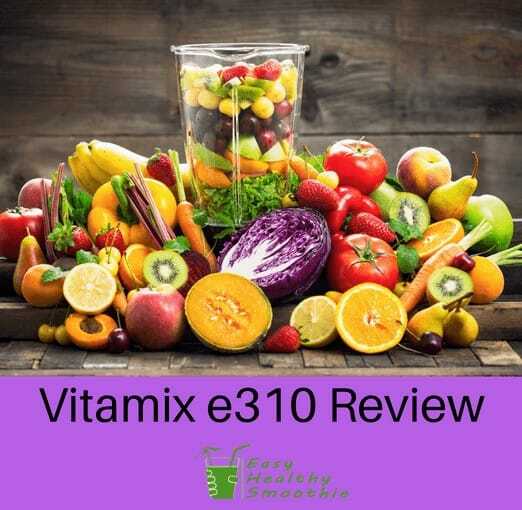 For those who are fans of other Vitamix blenders, the e310 is a smaller version that can work well for those who don't need to make so much of their various recipes. As a result of the smaller size, it also comes at a lower cost, highly convenient for those on a budget who still want a high-quality product. You'll still get the same reliability you've come to expect from Vitamix, in a slightly smaller form. Related Reading: Best blenders for green smoothies, read the reviews. Controls are simple and clear. Capable of handling a wide variety of foods in five different ways. Simple, easy settings and features. Not a lot of bells and whistles, but the features are effective. Those who look at the Vitamix e310 may find that it appears very similar to the Vitamix 5200, but in a 48-ounce version. This makes it better suited to individuals and smaller families. You may also notice that the same durable blades appear in this model, great for all kinds of recipes. Like other Vitamix options, this one is able to grind, emulsify or even heat the things you put into it; you can use it for soups and other warm recipes just as easily as cold one. In addition, it's also able to blend and chop, just like you'd do with a Ninja. Consequently, the e310 is a device that can handle all the tasks that could otherwise take several different tools. For those who don't have a lot of space to offer up to a multitude of cooking appliances, or just like the versatility, the Vitamix e310 is a great device. It's also one that is easy for users to control, giving them the ability to choose their preferred speed as well as use the pulse button for quicker jobs. What really brings it all together as a useful tool is the ability for it to self-clean. The Vitamix e310 is for those who enjoy the other Vitamix machines, but don't need all the space that the larger options offer. This is especially true if you would prefer to avoid paying for the space you aren't going to use. It's also a perfect choice for those who are looking to save a bit of money. Because Vitamix blenders tend to be a higher-end option, they can be on the expensive side. These certainly aren't blenders for just the casual blender user. However, that doesn't mean everyone wants to pay the highest prices. Consequently, the price of the Vitamix e310 is a bit lower and therefore keeps a little money in your pocket, while still providing a solid blender. If you want to save even more money, you can look into a used or refurbished option, just make sure the source is reliable! The largest part of the purchase is the blender itself. You'll want to make sure it's in good condition and starts up easily as soon as possible, just to make sure any potential problems are addressed quickly. On top of that, it should include the power cord, lid and blades all in good shape. You'll get the 48-ounce blender container as well as a mini-tamper, motor base and a convenient cookbook to help you with finding delicious things to make using the e310. On top of that, the 5-year warranty will ensure you're fully covered for a multitude of issues. If there's one feature that really makes this blender worth the cost, it's the self-cleaning ability. There are few things that can be more frustrating than trying to clean out a blender thoroughly by hand. With this machine, you won't need to worry about that problem. Furthermore, it contains stainless steel blades that should be able to hack through just about anything. They are designed to be durable and effective on fruit, nuts and many other food items. Make sure to be careful when using and cleaning the blender though, as the blades are likely to be sharp. With the versatility of this device, you won't have a problem with chopping, mixing and emulsifying a wide variety of foods. In addition, the included cookbook will give you plenty of options as far as things to make. It can also help to clear up space used by several different appliances. Overall, the Vitamix e310 is a truly useful tool, which is sure to be able to help you with making a wide variety of meals. Whether it's for a quick smoothie or a hearty soup, it's difficult to go wrong with this device. You'll be able to use different power settings as well as a pulse option for more sensitive foods. As a result, this is an ideal option for those who don't have a lot of space, are looking for a smaller option than other Vitamix machines, or who want one versatile tool that can do it all.